Trent: You know I used to wait two days to call anybody, but now it's like everyone in town waits two days. So I think three days is kinda money. What do you think? Mike: Yeah, but you know what? Maybe I'll wait 3 weeks. How's that? Tell her I was cleaning out my wallet and I just happened to run into her number. Both Made and Swingers are two of the more hip films of the past decade. While it is a great idea to include these similar comedies in one collector's edition box set, The Money Collection offers nothing new to whet our appetites. It is simply a repackaged version of two existing DVDs, with no added material to justify a repurchase. The Swingers disc is especially disappointing, as it is the featureless, nonanamorphic version released back when DVD was still in its infancy stage. Everything contained within this two-disc double feature is thoroughly entertaining, yet my reaction to a box set that is simply a reissue of existing material is average at best. Regardless of how they are packaged, these two films are destined to become classics. Swingers especially holds a high rank amongst the comedy genre. The film has been written with passion and flair by Jon Favreau and deftly photographed and directed by Doug Liman. I have always believed that when a director also serves as cinematographer, both aspects of filmmaking tend to suffer (see many of Peter Hyams' films). Yet, Liman executes both of these important elements of filmmaking quite admirably. Shot on a shoestring budget, the aesthetic of the film is dingy, grainy, and mostly comprised of lengthy shots that draw us straight into the heart of Los Angeles nightlife. Swingers is an all too real yet hilarious look at a group of struggling Los Angeles actors with a strong desire to party. The key players are Trent (Vince Vaughn), the arrogant but encouraging thrill seeker, and Mike, a neurotic New Yorker who does little more than complain about his ex-girlfriend. The film does not posses a greater sense of purpose, and it does not need to. Favreau's dialogue is so fresh, that one could gleefully quote nearly every line from the film. This is the movie that made it cool to use words like "money" and "baby" as terms of affection between two heterosexual males. I never cease to be entertained by moments like the one where Trent confidently tells Mike, "Baby, you're so money and you don't even know it!" All of the characters, from the lead to the support, are equally entertaining, and the fun is in simply watching them converse between one another. Most of their discussions lean towards the pursuit of girls, but on several occasions, their aspirations of stardom pave the way for interesting dialogues regarding motion pictures. A humorous moment in which the characters express their admiration for masterful filmmakers like Scorsese and Tarantino offers Liman a chance to playfully mimic shots from both Reservoir Dogs and GoodFellas. These admittedly stolen shots, the witty dialogue, and the engrossing nature of the characters all play out like cinema's answer to a raging party. Every moment in Swingers is wicked fun. It is a film that will easily connect with most moviegoers, even those who are not active participants in the party scene. Made, while not as overtly entertaining as Swingers, is filled with the same brand of quirky humor. Jon Favreau and Vince Vaughn again play the leading roles, while this time Favreau takes hold of the directorial reigns. Made is once again a simple Favreau-penned tale, telling the story of Ricky (Vaughn) and Bobby (Favreau), two friends who become caught up in a small-time mob affair. Though centered around completely different characters, much of Made feels like the continuing adventures of Swingers. It plays with a similar style and energy that proves to be both a strength and a weakness. Favreau expresses many of the same forlorn facial expressions as he did in Swingers, yet his character could almost be considered the exact opposite of Mike. In Swingers, Mike is little more than a whiner amidst positive influences, where in Made, Bobby is a headstrong individual amidst dangerously negative influences. Vince Vaughn's Ricky is less of a stretch; he once again plays a fast-talking but bumbling swindler. Ricky is the type of guy who tries as hard as he can to be suave, but has no clue what it truly means. It is almost as if his Ricky has tried to learn how to be hip by watching movies, but failed to fully grasp the concept of how to be sophisticated. What charm he possesses comes from his stupidity, thus making him both loveable and revolting at the same time. Regardless of my love/hate relationship with Ricky, he provides all of the biggest laughs in Made. Jon Favreau demonstrates good directorial skills for a first-timer; he consistently moves the camera in interesting ways and knows how to effectively tell his story. His obvious talents help to override many of his rookie mistakes. He tends to want to show off a bit too much, and often, I got the sense that less would have probably been more. Yet, much like Swingers, Made moves from beginning to end with a light and giddy charm. It is an unoriginal but entertaining film that proves to be less about its story than it is about watching these interesting characters weave their way from one situation to the next. It is a thoroughly enjoyable film made by talented individuals, and a wonderful companion piece to Swingers. Seeing that Made and Swingers are so similar, I applaud the decision to offer them together in one box set. With a price tag a few dollars less than the cost of purchasing each film individually, The Money Collection is a great way for fans who do not own either film to beef up their collection. However, I believe that true fans will want to hold out for the upcoming special edition of Swingers rather than owning this older, visually disappointing version. Image Transfer Review: The 1.77:1 anamorphic image on Made is visually pleasing. Colors are bold and vibrant, blending in nicely with the deep, thick blacks. The overall picture is smooth with few video distractions. The most significant downfall is a somewhat dusky quality, noticeable in dark scenes. Inaccurate contrast often causes these scenes to lose perceivable shadow detail. Grain is also apparent, yet never irritating. While not reference quality, there is little to complain about with this winning transfer. Swingers, on the other hand, gave me a bit more to complain about. First, and perhaps most bothersome, is the fact that this is the old, nonanamorphic version of the film. Needless to say, when viewed in "Zoom" mode on my anamorphic widescreen television, I was greeted to a world of video deficiencies. Colors are often unbalanced throughout, with flesh tones that appear grossly orange. The aesthetic of the image is consistently gritty, complete with an abundance of bothersome artifacts. 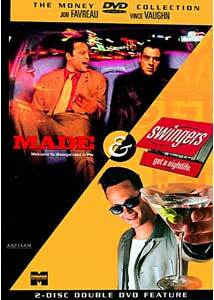 An anamorphic widescreen version of Swingers will be available on September 24, 2002; I suggest holding out for that edition. Audio Transfer Review: For a low budget film, I was delighted to find such an aggressive yet tasteful 5.1 mix on Made. The surround speakers are consistently utilized, often fully enveloping the listener with music and sound effects. Dynamic range is top-notch, extending from whisper quiet moments of dialogue to the raging sound pressure levels inside a dance club. The bass, while not as ravaging as that found in an action picture, gave my subwoofer a good workout and always remained tight and clean. Fidelity is excellent throughout, with a few rare exceptions when the dialogue sounds a bit distorted. This is an all around impressive sound mix that rivals much higher scale productions. Swingers features a less exciting 2.0 Dolby Surround mix. While somewhat lackluster, this soundtrack effectively serves its purpose of driving the narrative. The abundance of music displays a clean and clear presence, with wide stereo separation across the front soundstage, but little blend into the surrounds. The remainder of the soundtrack is predominately monaural. The main element of this film is the dialogue, which sounds clear and intelligible throughout. Though I did not find this mix terribly exciting, its commendable fidelity satisfied my expectations. Extras Review: Swingers offers a scant theatrical trailer and a two page static menu of film recommendations. Unlike Swingers, Made boasts the most enjoyable collection of special features I have seen in quite a while. First is the feature-length audio commentary with Jon Favreau, Vince Vaughn, and occasional participation by co-producer Peter Billingsley. This is an "action commentary", with the commentators drawing on the screen "John Madden style", circling or highlighting selected key visuals. Although the viewer has the option to turn off this cinematic equivalent of the CBS Chalkboard, I would highly discourage it, as it would result in missing out on half of the fun. In addition to this unique feature, the commentary is incredibly interesting and informative. It is obvious that Favreau and Vaughn are very passionate and proud of their film. Unlike many commentaries that focus on one or two specifics about the production, the duo discuss nearly everything one could possibly want to know about Made. This is one of the more gratifying commentaries I have heard in quite some time. Next is a 40-minute documentary, broken down into three featurettes. The first section is titled Getting it Made, which mainly focuses on Favreau and Vaughn's quest to make a film where they were in complete control of the project without any outside studio interference. The second section is The Creative Process, which documents most of the production, from its conception to its premiere. The third and best section is Making the Music of Made. I highly applaud the decision to devote an entire section to one of the most important yet often misunderstood elements of filmmaking. More Made Footage is a collection of deleted scenes and outtakes that run nearly as long as the main feature. As if nine hilarious outtakes, four deleted scenes, an alternate ending, and nine alternate scenes were not money enough, each clip is presented in beautiful anamorphic widescreen with an optional commentary from Favreau and Vaughn on the deleted and alternate scenes. More Music Cues is another fantastic feature honoring the power of song. Divided into two pieces, Used Cues offers the viewer the option to listen to 12 isolated musical cues from the film, while Unused Cues offers a whopping 26 isolated musical numbers intended for, but not featured in the film. More DVD special features need to recognize the magic of music in motion pictures. The Scene Editing Workshop offers a fun chance at DVD interactivity. The viewer is given the opportunity to assemble four different angles from four different shots, and edit them together into a cohesive scene. When finished, the viewer can view the completed construct, and even compare that version to the version of the scene that appeared in the film. I composed two variations, yet neither of them seemed to be as good as Favreau's version. That is why he is the filmmaker and I am but the humble reviewer. All of the special features are presented in anamorphic widescreen, with the exception of the theatrical and teaser trailers, which I find a bit puzzling. Nevertheless, these are good trailers that fully express the quirky nature of the film. Rounding out the unique collection of special features are cast and crew biographies and filmographies as well as a brief section of production notes. Made and Swingers are money, baby. However, for only a few dollars more, one can own the same version of Made, as well as a far superior special edition of Swingers in September. A clever method of selling copies of the outdated, nonanamorphic Swingers, the existence of this Money Collection seems really nothing more than the studio's way of satisfying an insatiable lust for more money...baby.